Best Time of Year to Visit Phuket? We are into the hot and dry season now, though there have still been some strong breezes blowing from the east cooling the air a little. For the next 2½ - 3 months things get hotter, you can't expect much rain, all tourists get burned and all locals start to invest in more aircon units. A great time of year to visit! Hot and sunny, calm seas, not too crowded as peak season is over, see you soon! Yesterday I had a day off, hoorah! 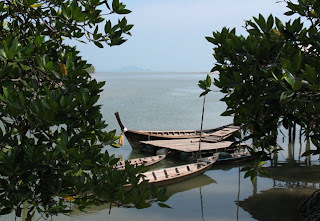 We drove up the east coast of Phuket to Bang Rong, where you can find a small floating restaurant. It's very quiet in this area, and we will be back again soon. It's only 20 minutes drive from our house. There were a few spots of rain last night. Enough to save me watering the garden this morning. It's a hard time of year for plants, and Phuket does start to look a bit thirsty in the dry season... waiting for the rains and the "green season". For now, though, let's enjoy the sunshine and I don't want to hear anyone complaining about the heat. I was just chatting with me mum on Skype... she said "It was minus 6 C when we got up this morning".